The answer touches a sensitive aspect of Mexican history: the resentment many Mexicans feel at the vast amount of riches that foreigners (Spanish, French, Austrian, North American and English ...) have reaped from their country since the arrival of the Conquistadores in 1519. Before Worth Abbey (now also a school) became a Benedictine Monastery in 1933 it was called Paddockhurst, and was one of the splendid homes of Viscount (Lord) Cowdray, a Yorkshire businessman (born Weetman Pearson) and MP who became the sixth richest man in Britain out of the huge wealth he made from exploiting Mexico’s first oil production under the dictator Porfirio Diaz. His extensive interests in Mexico, from construction of railways, dams, harbours and tunnels to mining and manufacturing, from rural estates (on the eve of the Mexican Revolution in 1910 Pearson’s Mexican Estates Company controlled well over a million acres of land) to his ownership of the ‘El Aguila’ oil company, meant that he was so often absent from the House of Commons that he earned the nickname ‘The Member for Mexico’. 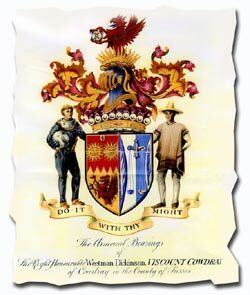 In recognition of the source of so much of his wealth, Pearson not only added the Mexican eagle emblem to one of his homes but also included a Mexican ‘peon’ (labourer) in the Cowdray coat of arms on becoming a peer. The Eagle Oil and Transport co. tankers (ships) carried the profile of the Mexican eagle and snake on their funnels and flags. Regards Ted. I’m doing iconographic research for a book about the roots of petroleum nationalism in Mexico and I’m very interested in getting a high resolution image of the Cowdray arms. Where can I get it?